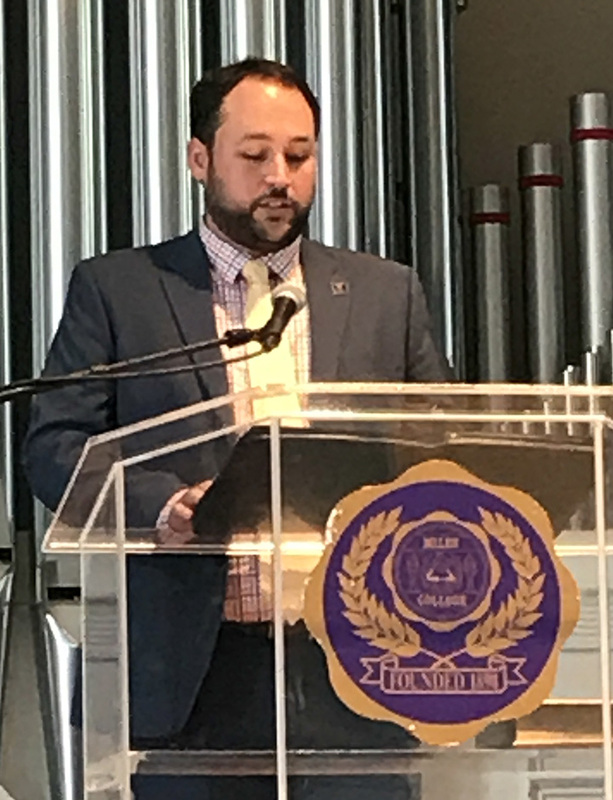 Jake Newsome spoke at Miles College in September, in the first of a series of events comparing Nazi Germany and the Jim Crow South. As part of the programming in advance of Birmingham’s Violins of Hope experience, the University of Alabama at Birmingham’s Institute for Human Rights is hosting a symposium this month on lessons that can be learned through the study of Nazi Germany and the Jim Crow South. “Bystanders and Complicity in Nazi Germany and the Jim Crow South” is part of a series of programs, coordinated through the United States Holocaust Memorial Museum in Washington, to explore lessons that can be learned through studying both periods of history. 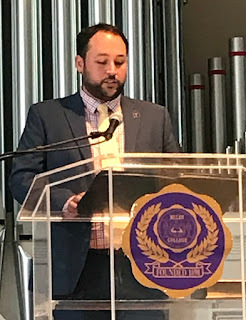 The first program was held at Miles College in September, followed by a similar panel at the University of South Alabama. Jake Newsome, campus outreach program officer for the museum, said he hopes to also have programs in other parts of the region. The Violins of Hope programs center around an effort by Amnon Weinstein, a violin maker in Israel, to restore violins that had been played in the Holocaust. He has restored more than 60 since 1996, and his intent is that they be played rather than just being displayed, as an ongoing voice for those who were silenced in the Holocaust. The centerpiece of Birmingham programming will be a concert by the Alabama Symphony on April 14 at the Alys Stephens Center, with some of the violins as part of the orchestra. The Feb. 22 and 23 symposium will be held at UAB’s Alumni House starting at 9 a.m. each day. Panels will explore the differences between the history of racism in Nazi Germany and the Jim Crow South, but also how some universal phenomena manifested in these distinct historic events. Both events can trace part of their roots to the rise of a new “science” of eugenics, which became an international movement that was used to give legitimacy to racial policies. Racism, including racial anti-Semitism, was the core element of Nazi ideology and driving force behind the Holocaust. Racism also legitimized the continued subjugation and persecution of African Americans long after the end of slavery. Part of the perpetuation of those systems came from a minority of determined leaders with the support of an acquiescent general population, with a majority in each community witnessing persecution but actively or passively tolerating it, enabling the persecution to continue. This symposium brings together scholars, students and community members to engage in meaningful dialogue on how, when, and why ordinary people supported, complied with, ignored, or resisted in two very different systems of targeted oppression and racial violence. The symposium will start on Feb. 22 at 9 a.m. with remarks from Robert Palazzo, dean of the UAB College of Arts and Sciences; Tina Kempin Reuter, director of the Institute for Human Rights; Robert Ehrenreich, director of national academic programs at the USHMM; and Newsome. The afternoon session will include an education roundtable, “Teaching Nazi Germany and the Jim Crow South. Students will present their posters at 4 p.m., followed by a 6 p.m. program on “Keeping the Memory Alive: Personal Reflections on the Legacies of Racial Violence and Genocide.” Speakers will be Riva Hirsch, a Holocaust survivor in Birmingham’s Jewish community, and Josephine Bolling McCall, whose father was lynched in Alabama in 1947. They will give their thoughts on the personal impact of violent antisemitism and racism in two historical contexts. The Feb. 23 sessions begin with a “Personal Agency and Resistance” panel, followed by presentations from students around the region, describing their work on the history and relevance of Nazi Germany and the Jim Crow South. The lunch session will be “From Memory to Action: History and the Power of Human Rights, with panelists offering their thoughts on the contemporary relevance and power of history to inspire individuals to confront hatred and promote human dignity in their communities. Closing remarks will follow at 2 p.m. Registration is free, and is available here. The Birmingham Holocaust Education Center is also a co-sponsor.